This Pasta with Clam Sauce recipe makes for the perfect 20 minute weeknight dinner, Easy to make and full of flavor. Sometimes a really quick and simple dinner is all you’re looking for aka this pasta with clam sauce. You don’t even need it to be spectacular – just easy to make and filling. 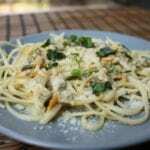 That’s all I was looking for when I decided to make this pasta with white clam sauce recipe. Not to worry – you can still serve a delicious meal. If you’re looking for a bit of a challenge – skip the canned clams and go for the real fresh ones. I’m not ready for that yet, but maybe you are? I used canned clams in this recipe but I am sure the fresh ones would be even more delicious — especially the fresh clam juice would add a ton of flavor to this recipe. I’m all about buying and cooking fresh mussels but I have actually never bought fresh clams before. Surprisingly I never order them when I’m out either; mussels yes but clams not so much. I honestly have no idea why though because I genuinely loved the flavor of the clams in this pasta with clam sauce recipe. Time for that to change. Please share if you buy fresh clams and what your go to clam recipes are. I would love to learn more about cooking with fresh clams! I mean there’s always the classic New England clam chowder — which I have also made with canned clams – so it’s time to get cooking with fresh clams, so next time I make this pasta with clam sauce I’ll be using the fresh clams instead! Good idea right?! 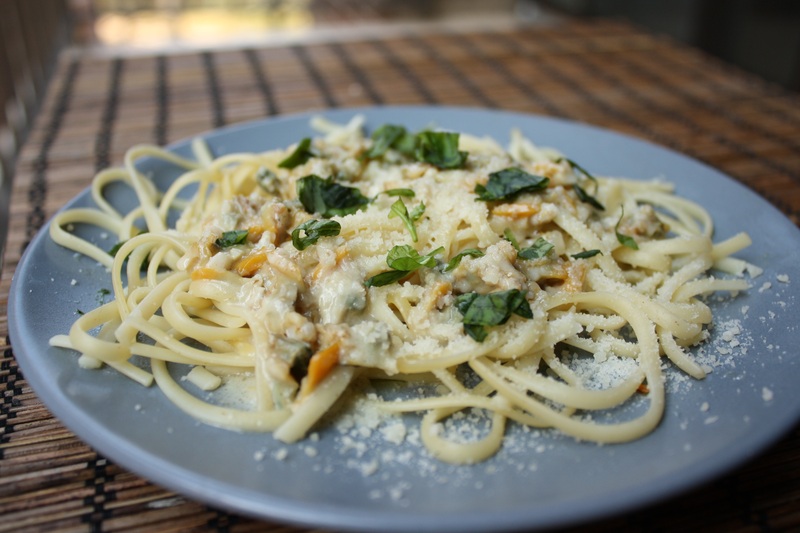 Let me know what you think of this pasta with clam sauce in the comments below! For other pasta recipe ideas be sure to try my creamy shrimp pasta and pesto chicken pasta! Over medium-high heat heat butter and olive oil. Add garlic once butter has melted and cook for 1 minute. Add clam juice and white wine to pan, bring to a simmer, and cook until liquid has reduced by half. Add minced clams and heavy cream, stirring to combine. Add salt, and pepper to taste. Serve over pasta, sprinkled with grated Parmesan and chopped basil.